To order a printed copy of the Rajapack Packaging Materials catalogue, simply click the Request button below. Professional advice. Their expert team of packaging specialists are available to provide you with professional advice and guide you in selecting the right packaging for your business. Product sample service. On many of their products they offer a sample service so that you can make sure a product meets your requirements before you buy. NEXT day delivery. All orders received by 4.30pm will be delivered by 5.30pm the next working day. If your order is over £200 it will be delivered for FREE! Save money by buying in bulk. With their bulk buying discounts you can save money by placing bigger orders on the products you use most frequently. For large quantities of packaging or a quote on a large order: Speak to their customer development team or request a field sales visit. Easy payment options. You can choose to pay by account with 30 days credit (subject to status) or by credit card or cheque. Rajapack Packaging Materials Catalogue Vince D. said: Vert usefull book for all tyoes of packaging. 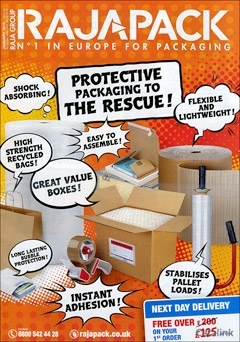 Rajapack Packaging Materials Catalogue Trevor A. said: Best ranges ive EVER come across second to none! Rajapack Packaging Materials Catalogue Robert W. said: Didnt have the specific products I wanted, but for what they do sell, the catalogue was excellent. Rajapack Packaging Materials Catalogue David John T. said: A great place to start if running a small business that needs packing and postage items . Rajapack Packaging Materials Catalogue Tim T. said: Its handy as an artist I am often buying packaging products to either send work in the post or simply to package up customers purchases on site, so i will be ordering from the catalogue in the future when I need new supplies. Rajapack Packaging Materials Catalogue Lori B. said: Very comprehensive brochure. Rajapack Packaging Materials Catalogue Derek B. said: Very Comprehencive. By pressing the Request Printed Catalogue button you give consent to Rajapack Packaging Materials (and their Data Processors for the specific purpose of delivering your literature) to send you their Catalogue.